When I wrote about quantum moments, someone told me that I quit a job for an easy way out, and I don’t have stamina to survive in a competitive environment. He made me review every life decision that has brought me where I am today, and I appreciate that. When I looked back, I realised that I quit a few things in life besides jobs. A part of me died when I became part of a giant profit making machine. It was scary to wake up feeling lost and questioning my life purpose every day. I quit so that I can start things that I care enough to move forward without fear. Every time I push myself through tough times I expand my resilience a little more. Every new thing that I accomplish makes me see the world a bit differently. Our life story shapes the way we see life. I understand that it is not personal when people doubt my beliefs and actions. I might not be agreeable all the time, but it is more important that we accept differences and learn to build trust upon that. When we reach out to the others and try to understand, I believe that we are all the same – everyone has goodness deep inside them. Sometimes, growing up means stop partying and quit drinking, stop hanging out with people who complain all the time, and stop trying to be part of ‘in group’ for the sake of being cool. 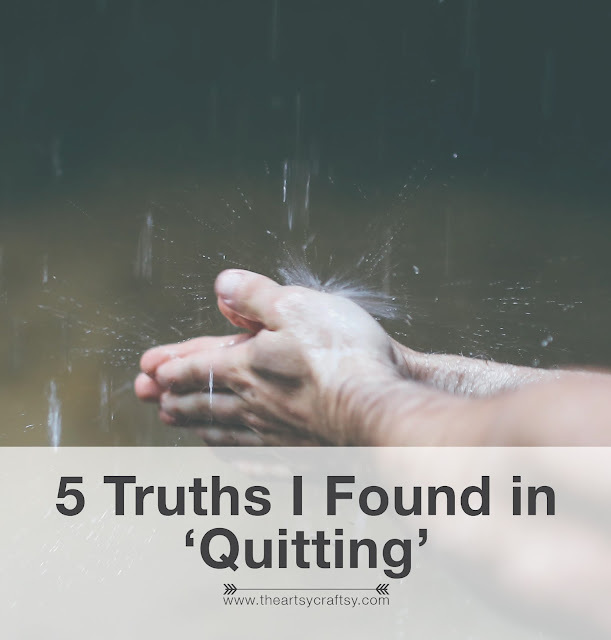 Quitting those things doesn’t mean that I deny my younger self. I will always honour my past for shaping who I am, and I appreciate the lessons that I’ve learned from it. We need to move forward to do greater things. The best thing that I learned from backpacking trips is to see how people smile simply and love simply in their everyday life. Then I realised that the sense of abundance come from within when we appreciate what we are given in life. When I stop thinking about acquiring stuff that I do not need, I start living in the present and creating things that I’m proud of. It doesn’t matter what other people own, I know exactly what I need to have ‘enough’. If I have a million dollar right now, I have no idea how to extract the most value out of it. I am going to explore different things and take on new adventures in life. I will see a bigger world to understand how a million dollars can change a million lives. When I have wisdom and tools to make every single cent counts, I believe that money will come to me, and help will come along the way. I will learn to give before I take. It could be more difficult than staying in comfort zone and following status quo. It could involve hard struggle and tremendous courage before someone chooses to make a stand for himself. It requires deep understanding of what really matters in our life to be able to withstand stigma and criticism that come along with quitting. I will not quit loving myself and people around me, learning, growing, and creating beautiful life experiences. Sometimes, it’s okay that people call you a quitter, because you know you will spend your life doing things that you care enough not to quit.